The one thing I can say about Utah weather, is that it's incredibly unpredictable. I'm not exaggerating when I say one day it will be warm and sunny and the next will be a crazy snowstorm. You'd think I'd learn by now and be prepared for any event, but that just isn't the case. On this day we went to the movies (we saw Crimson Peak, so good!) 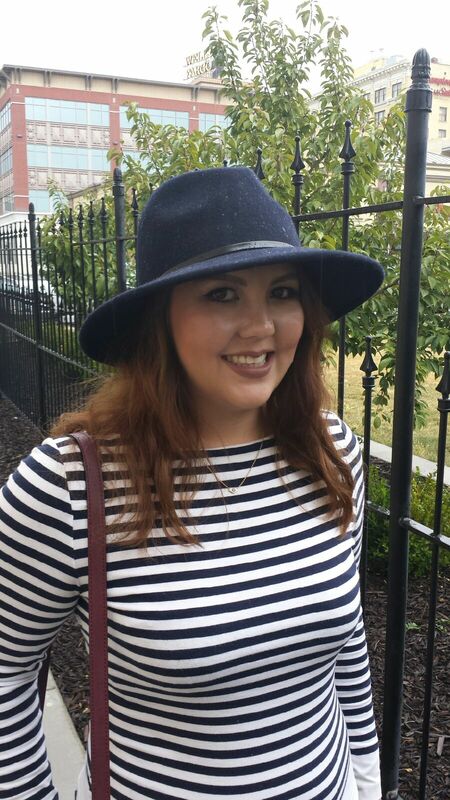 and although I had my hat (thank goodness!) I really should have had a jacket with me. These are my favorite jeans at the moment. They're distressed patchwork jeans by the brand Vanilla Star. I got them very recently from Shopko for a killer price as they were on clearance! 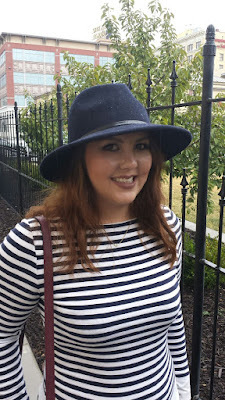 My top is from H&M last year and hat is from Forever 21. Both these styles seem to be around everywhere this year so you can find similar items in store or online. I've talked about Angela and Roi in a previous post. 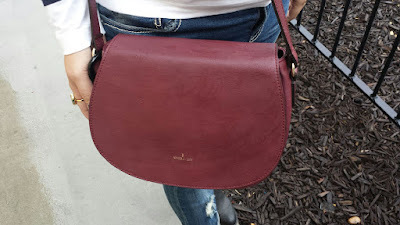 They are one of my favorite handbag brands as some of the proceeds from every purchase go towards a good cause. This is the Morning Plum cross-body bag which supports the Alzheimer's Foundation of America. This is one of my favorite bags, the quality cannot be beat and the size is perfect for day to day. You can find the bag here. My booties are Steve Madden which I purchased at Ross a couple of years ago. 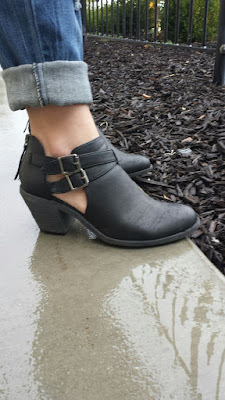 These are some of my favorite shoes as I can wear them year round...although I wouldn't recommend them during a downpour. As you can see from the closeup picture of my cut-out booties, it was incredibly wet outside at the time we took these pictures. Like I said, thank goodness I decided to wear my hat that day since I (rather impractically) didn't have a jacket. It's still one of my favorite Fall outfits, although let this be a reminder to me to throw on a leather jacket next time! You look so cute! Love the striped top and the handbag looks really well made. I know what you mean about Utah weather. Not missing that one bit. Lol. Such a cute outfit! Love the hat and boots! 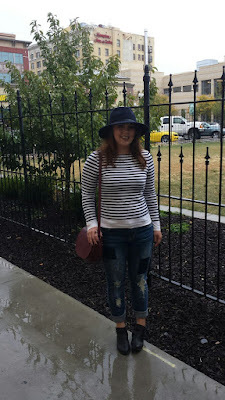 This outfit is so cute and perfect for your rainy day in Utah. I really like the jeans and can see why they are your current favorites. Also, the bag is really amazing. I love that it's a classic style and for a good cause. I hope you're having a fantastic week! You look fabulous, girlie!!! 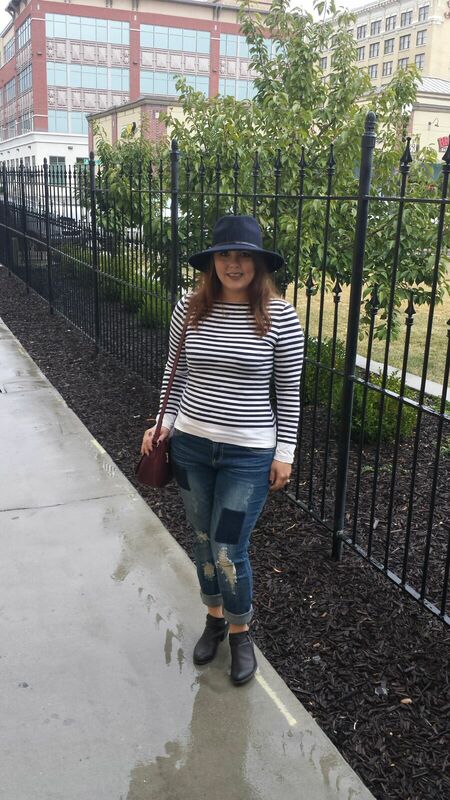 Ahhh that hat and the stripes look amazing on you!! Gorgeous handbag as well, hon. Day dates are fun and glad you had a great time at the movies! I would absolutely love to visit Utah one day with my hubby!